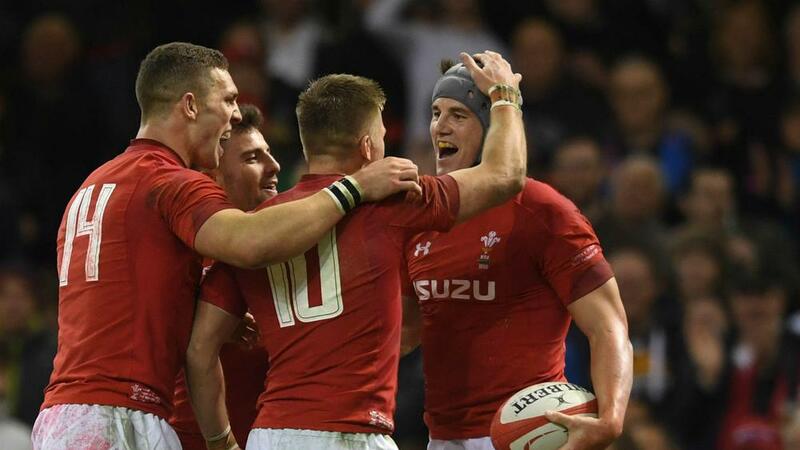 Jonathan Davies marked his first Wales appearance in nearly a year with a try as Wales began their November internationals campaign with a 21-10 win over Scotland. A serious ankle injury had kept centre Davies on the international sidelines since last autumn, but he was on hand for what proved a decisive second-half score after Scotland had responded well to a strong start from the hosts in Cardiff. Three penalties from Leigh Halfpenny and a George North try put Wales in control, only for Stuart McInally to pull Scotland within four points at the break. However, Wales took full advantage of some dreadful Scotland defence with a sweeping attacking move that Davies finished off to secure the inaugural Doddie Weir Cup. Wales face Australia next week, while Scotland will seek to bounce back against Fiji in Edinburgh. Halfpenny made the most of early ill-discipline as he booted over three penalties inside the opening 23 minutes to give Wales a measure of command. Adam Hastings responded with a three-pointer of his own before North made light work of attempted tackles from Huw Jones and Alex Dunbar to cross for the game's first try. This time, Halfpenny failed from the tee and the 11-point lead was soon trimmed to four as McInally plunged over from the back of a maul and Hastings added the extras. Scotland's defensive issues proved their undoing as Wales made the most of an excellent line-out ball seven minutes into the second half, Gareth Anscombe feeding Davies through a gaping hole and giving him an easy run to the line. Gregor Townsend's men again produced a strong reply but could not force their way over despite intense pressure on the Welsh line. Jonny Gray was denied by the TMO as Wales survived multiple phases penned on their own line, and their task in keeping Scotland at bay was made even harder when Elliot Dee was sent to the sin bin. Peter Horne then failed to collect George Horne's kick into the in-goal area and reduce the arrears, his inability to handle summing up a frustrating afternoon in all areas for Scotland.